The folks at Coudal Partners have been posting some fantastic stuff as part of their Swap Meat. Both Ben Schlitter and I did our best to represent Hays, KS with the projects that we sent in. Ben’s GEO + INFO postcards made it to the Swap Meat page as did my calendar tags. I ended up creating a new edition of 50 calendars specifically for the occasion. I might also mention that Ben has a great website dedicated to his geography + information project that’s worth checking out. A friend of mine, who will soon graduate from law school, requested two unique guest books to commemorate the celebration of her graduation. She sent me some old law books that she was eager to rid herself of and as I worked with them, I discovered a new process. I found that reusing book cloth from hardbound books is fairly easy. After removing the covers from the inside pages, I carefully peeled the book cloth away from the existing book board. I removed the paper fibers stuck to the back of the cloth with a dish scrubber and water. Once the cloth was clean and dry, it was ready for reuse. I created much smaller versions of the law books, using pages of data from the old books for the end sheets and filling the books with blank paper. This project began several years ago, when I was enrolled in Graphic Design 2 at Fort Hays State University. I always tried to do my assignments as far ahead of time as possible, but being extremely picky about the concept and design never left me much, if any, extra time before critiques. This began as one of those “work on something for two weeks and get a much better idea the night before it is due” kind of projects. I ruminated over the meaning of a calendar for two weeks and realized that it’s just a way to put a tag on time. That thought provided me with a unique format. I recently revisited this old project to redesign it. I drew inspiration from antique tags used to label industrial materials. 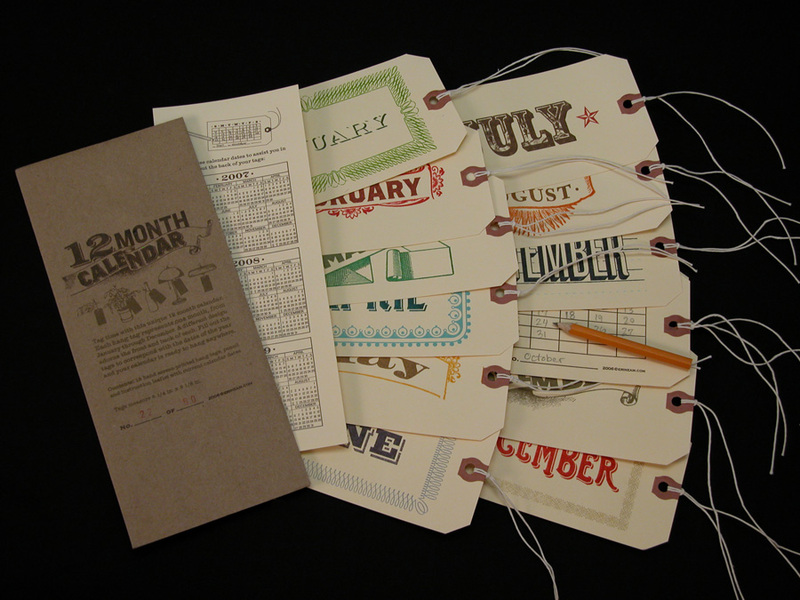 This provided me with the idea of filling in the dates with a pencil, so that the tags can be reused from year to year. In my research, I also discovered a wealth of patterns and typefaces from this time period that lent themselves well to the project. For the first edition, I created 60 sets of calendars. I purchased the tags from a local office supply store and used a Print Gocco (a handy dandy screen printing tool) to print them as well as the packaging. I sold most of these via Etsy at the beginning of the year. I am currently printing a second edition of 50 for Coudal Partners Swap Meat, with a few changes here and there to differentiate from the first edition. Etsyjournal is a collaborative art project for the Etsy community, organized by artists Lauren (StellaLoElla) and Heather (DecadenceDesigns). The project centers around a blank handmade book which is passed from one Etsy artist to the next. Each artist has the opportunity to fill one spread of the book before sending it on. 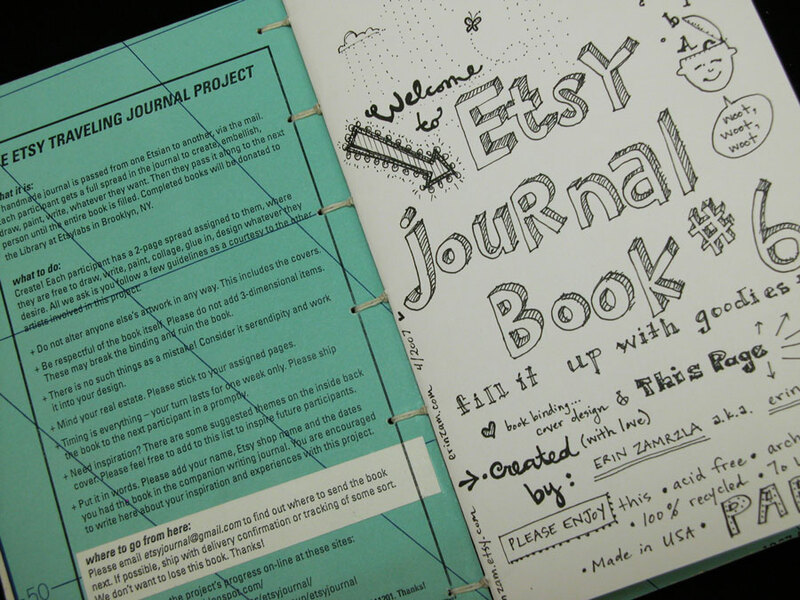 Once the journal is filled, it will reside in the library at the Etsylabs in Brooklyn. The project is doing fantastic, with four books already in circulation and a second round on the way. I had the great opportunity to create etsyjournal number 6. Although the book needed to fit within certain guidelines to function for the project, the cover and title page were a blank canvas. For the cover, I stitched together pieces of vintage wall maps (found in a dumpster!). Not only do I love the vibrant colors of these maps, but they lend themselves perfectly to the concept of the etsyjournal project. The project brings together people from very different locations and backgrounds in a unique way. You are currently browsing the Erinzam News weblog archives for April, 2007.